Shown is the car which was struck June 28 by a loose wheel that flew through the air and killed Jeffrey Calhoun, the father of Jeffrey Ryan Holsinger, the Greenfield man accused of two fatal shootings on July 4, the day after his father’s funeral and cremation. Highland County authorities have questioned the man suspected of killing two people and injuring another in a deadly Fourth of July shooting spree, and he is set to appear in court Friday afternoon, according to Highland County Sheriff Donnie Barrera. 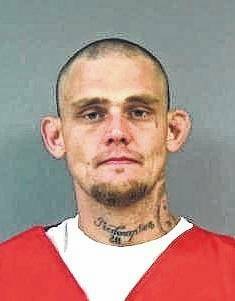 Jeffrey Ryan Holsinger, 31, was booked into the Highland County jail Wednesday evening after being held in Franklin County, where he was captured late Tuesday night following a manhunt involving multiple law enforcement agencies. 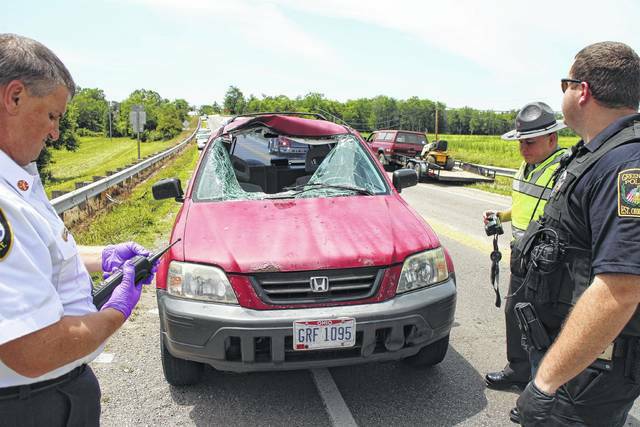 Holsinger is the son of Jeffrey Calhoun, the 56-year-old Greenfield man who was killed in a freak accident June 28 when a wheel came off a homemade trailer and flew through the windshield of a car in which he was a passenger. Calhoun’s visitation and cremation were held July 3, the day before the shooting spree. Holsinger is listed among Calhoun’s survivors in his obituary. At the Justice Center on Wednesday, Holsinger was photographed and fingerprinted. The booking entry lists his height at 6’2 and weight at 170. Barrera said Highland County Sheriff’s Detective Randy Sanders and detectives from Ross County questioned Holsinger Wednesday evening, and although Barrera was hesitant to release details since the case is under investigation, he said the line of questioning in Holsinger’s interviews centered around a possible motive. “I’m sure that’s probably what was brought up,” Barrera told The Times-Gazette. Holsinger is slated to appear in Hillsboro Municipal Court at the Highland County Justice Center Friday at 1 p.m., and Barrera said Judge Robert Judkins of Highland County Court in Greenfield will preside as visiting judge. Holsinger is currently charged with aggravated robbery, a first-degree felony, although Barrera said he expects further charges to be filed as Sanders and Highland County Prosecuting Attorney Anneka Collins build a case. The individual shot dead near Greenfield was identified as Steven Mottie, Jr., according to Dr. Jeff Beery, the Highland County coroner. Beery said Mottie suffered a gunshot wound to the chest. Beery said Mottie has a Jefferson Street address as his listed residence. An individual who was struck on the head with a pistol was the gunshot victim’s father, Barrera said Wednesday. Barrera said that in addition to other charges that will be filed, Holsinger is charged with aggravated robbery connected to the assault on the victim’s father. A hearing was held for Holsinger early Wednesday afternoon in Franklin County, after which he was ordered transferred to Highland County. During part of his alleged shooting spree, Holsinger was accompanied by a woman, who may have been with him voluntarily at first, but who later escaped him, said Barrera. Barrera said he hoped to interview her as well. https://www.recordherald.com/wp-content/uploads/sites/27/2017/07/web1_tirewindshield.jpgShown is the car which was struck June 28 by a loose wheel that flew through the air and killed Jeffrey Calhoun, the father of Jeffrey Ryan Holsinger, the Greenfield man accused of two fatal shootings on July 4, the day after his father’s funeral and cremation.